Free Flow Wines is the forerunner of premium wine on tap, enabling the world’s best wineries to deliver their wines to consumers nationwide in the format most favored by winemakers and operators alike: on tap. Free Flow’s industry-leading technology has allowed the wine and hospitality industries to move towards a more sustainable, environmentally-friendly method that maintains wine integrity from the barrel to tap. Founded in 2009, Free Flow Wines has more than 220 wine brands in kegs with appellations ranging from the north western states throughout the US as well as to New Zealand, Argentina, and Europe. Their clients' wines are offered to a variety of restaurants, premium hotels, sports and entertainment venues nationwide. The company is located in Napa, California, and you can find them online at FreeFlowWines.com, on Twitter, Facebook, Instagram and Flickr @FreeFlowWine. Free Flow Wines’ state-of-the-art kegging and production facility is located in Napa, CA. Vetted by the world’s most sophisticated quality control teams, our processes and procedures were developed entirely in-house, to ensure that premium wines get from the barrel to the tap, tasting just the winemaker intended. Our fully automated kegging line cleans and fills kegs, ensuring that every keg is wine-ready. Our facility is also home to a custom water reclamation system that cleans over 95% of our wastewater for reuse. To improve our logistical footprint and offer additional services to wineries looking to fill on the east coast, Free Flow Wines will be opening an East Coast Filling Station. Our office located in Napa, CA and is the home to our production facility. In the area? Feel free to call us at 415-626-1215 and set up a tour Monday through Friday from 9AM to 5PM PT. Free Flow Wines was founded on a principle: to reduce the carbon footprint of the wine industry and improve wine quality. One 19.5L keg eliminates 26 empty wine bottles, corks, labels and cardboard boxes from going to the landfill or being recycled. Our facility is located in Napa, CA and is vetted by the world’s most sophisticated quality control teams. Our fully automated kegging line cleans and fills kegs, ensuring that every keg is wine-ready. Our facility is located in Napa, CA and is home to a custom water reclamation system that cleans over 95% of our wastewater for reuse. There are over 4,000 accounts pouring wine on tap in the states. Head to www.trywineontap.com and browse the Accounts List to find wine on tap near you! We're making wine smarter, fresher and friendlier through Wine on Tap. Check out our video and then go to our website to find out how to get involved! Nominations Now Open for Free Flow's People's Choice KEGGY Award! Nominations are now open for this year's People's Choice #KEGGYAward! This award was created to honor exceptional restaurants, bars, hotels or venues showcasing an incredible wine-on-tap program with the use of Free Flow's reusable stainless steel kegs. Show your favorite account some love and nominate today! As an Account Manager in our Customer Success Department, you will have your finger on the pulse of all happenings within Free Flow and the larger category of wine on tap. Top-notch customer service, category education and a can-do attitude has been critical to defining Free Flow’s reputation to date. This role will be responsible for all of our Kegging customer relationships from engaging key leads to ongoing customer management and retention. Not only will you work daily with our customers to help grow their keg programs, but you will work with every team at Free Flow to ensure success on all fronts. Other miscellaneous projects including data entry, technical troubleshooting & administrative tasks. Regular hours are 8:00am - 5:00pm Monday through Friday. If you’d like to be considered for this position, please, submit your resume via email to jobs@freeflowwines.com and include “FFW Account Manager” in the subject line. To meet the increasing demand for sustainable alternative packaging, Free Flow Wines has relocated their headquarters and West Coast operations to a new facility in Sonoma, CA. Sonoma, CA. February 20th, 2019 – Free Flow Wines, the pioneers of premium wine on tap, recently relocated their headquarters from Napa, CA, to a new expanded facility in Sonoma, CA. The new 58,000 sq. ft. facility, at 21945 Carneros Lake Lane, houses a state-of-the-art kegging line, increased canning services and temperature-controlled bulk wine storage. Phase two of the expansion, set for later this year, will include a new high-speed canning line and increased office space under the same roof. “As we enter our 10th year in business, Free Flow is thrilled about expanding our operations to meet the growing demand for sustainable alternative packaging. The new facility has highly automated kegging and canning lines that will allow Free Flow to grow both categories for the next 10 years,” states Jordan Kivelstadt, President & Founder of Free Flow Wines. The new custom-designed, fully-automated wine kegging line from Comac fills up to 150 kegs per hour, and is expandable to 300 kegs per hour. Free Flow’s expanded bulk wine storage program will allow customers to have more fill-on-demand flexibility, improved bulk wine transport logistics and lower costs. Free Flow’s expanded canning program includes three CODI counter-pressure fillers that can fill multiple formats with an array of custom end-packaging options. Phase two of this expansion will include a fully-automated, high-speed canning line coming this summer. The new state-of-the-art Krones Craftmate filler will offer more than 15 packaging configurations to start, with industry leading wine-focused quality control enhancements and speeds for larger canning projects. Free Flow will be partnering with CanSource, the leader in can sleeving services in the US and Canada, to provide turnkey can sleeving services at the new Sonoma facility. Free Flow’s increased production capacity will accommodate filling up to 1,100,000 kegs and 5,000,000 cases of cans per year, and store up to 375,000 gallons of bulk wine. Free Flow Wines, the pioneer of premium wine on tap, aims to deliver the freshest, best tasting, most sustainable glass of wine. Free Flow’s keg leasing, filling, logistics and canning services have allowed the wine and hospitality industries to move to a greener, fresher, better way to serve wine by the glass. Founded in 2009, Free Flow has more than 250 wine brands in keg, from wineries throughout the world. Premium wines in Free Flow kegs and cans are available at restaurants, hotels, retail stores, sports and entertainment venues nationwide. Free Flow Wines currently has headquarters in Sonoma, California, and a production facility in Bayonne, New Jersey. Catch up with the Free Flow team at Unified - booth #142! Going to Unified next week? Come see the Free Flow team at booth #142! Going to the WIN Expo next week? Come say hi to the Free Flow team at booth #227 and taste some delicious wines-on-tap! Free Flow Wines announced 22 new winners at the 5th annual KEGGY Awards honoring wineries, distributors, equipment providers and restaurant operators for their exceptional and sustainable contributions to the wine on tap category. The award ceremony was hosted at Pine Ridge Vineyards in Napa on October 11th, 2018. To date, more than 17 million bottles, or approximately 25.8 million pounds of waste, have been diverted from the landfill through the use of Free Flow’s reusable stainless steel kegs. Each Free Flow keg holds the equivalent of 26 bottles of wine and will save 1,560 bottles from the landfill over its lifetime. Free Flow currently works with over 140 winery partners and 270 distribution partners serving over 5,000 wine on tap accounts nationwide. Check out more Free Flow Stories Series here. Free Flow Wines breaks ground on a new facility and hires a Chief Operating Officer to meet the increasing demand for sustainable alternative packaging. Napa, CA. June 20th, 2018 – Free Flow Wines, the pioneers of premium wine on tap, announced plans to expand operations and relocate their headquarters to Sonoma, CA in January 2019. The new Sonoma facility, currently under construction at 14900 Carneros Lake Lane, will include a state-of-the-art kegging line, expanded canning services, temperature-controlled bulk wine storage and increased office space. To help support the expanded operations and company growth, Free Flow has appointed Rich Bouwer as Chief Operating Officer. “Free Flow has been building the premium wine on tap category for nearly a decade. Our facility expansion will allow us to improve services and increase capacity, helping us achieve our goal of saving more than 100 million bottles from the landfill in the coming years,” states Jordan Kivelstadt, CEO & CoFounder of Free Flow Wines. Free Flow’s increased production capacity will accommodate filling up to 1.1 million kegs and 5 million cases of cans per year, and store up to 375,000 gallons of bulk wine. A new custom designed Comac kegging line will fill 150 kegs per hour, with pre-designed modules that can increase capacity to 300 kegs per hour. The expanded bulk wine storage program will allow Free Flow’s customers to have more fillon-demand flexibility, improve bulk logistics and lower costs. In conjunction with the move, Free Flow will be partnering with CanSource, the leader in can sleeving services in the US and Canada, to provide turnkey services at the new Sonoma facility. “Free Flow revolutionized the wine-on-tap category, and now together we will do the same with wine-in-a-can. Our strategic partnership will allow us to be a one-stop-shop for labeling, filling and packaging all under one roof, allowing our joint customers more flexibility while driving costs down,” said Pat Hartman, Co-Owner of CanSource. Rich Bouwer began his new role as Free Flow’s Chief Operating Officer on June 11th, 2018 to support the company’s rapid growth. Bouwer has held previous roles at Saxco International, Treasury Wine Estates and Gallo, and brings more than 25 years of operational and leadership experience. “I am delighted to join the Free Flow team. They have been changing the way premium wine is delivered to restaurants and venues, and I look forward to being a part of the continued success with this first rate team,” says Bouwer. In addition, Free Flow expanded their Board of Directors to include Richard Gerstein and Lane Cardwell, bringing a wide range of experience from the logistics and restaurant industries. As the pioneers of premium wine on tap, Free Flow Wine aims to deliver the freshest, best tasting, most sustainable glass of wine. Free Flow’s keg leasing, filling, logistics and canning services have allowed the wine and hospitality industries to move to a greener, fresher, better way to serve wine by the glass. Founded in 2009, Free Flow has more than 250 wine brands in keg, from wineries throughout North America, South America, New Zealand, Australia and Europe. Premium wines in Free Flow kegs and cans are available at restaurants, hotels, retail stores, sports and entertainment venues across the US. Free Flow Wines currently has locations in Napa, California and Bayonne, New Jersey. You can find them online at FreeFlowWines.com, on Twitter, Facebook, Instagram and Flickr @FreeFlowWines. Nominate Your Favorite Wine-On-Tap Account for a KEGGY! Every year Free Flow celebrates our partner’s outstanding sustainability achievements at the KEGGY Awards. Nominations are now open for the People’s Choice Award created to honor the most popular wine-on-tap account of the year. Click here to nominate your favorite place to enjoy wine-on-tap! Announcing Free Flow's Draft Equipment Leasing Program! Free Flow Wines, the pioneers of wine on tap, announced the launch of a Draft Equipment Leasing Program to help hospitality and restaurant operators nationwide finance the cost of wine-on-tap draft systems. In partnership with Marlin Business Services, this flexible financing program will be available for all draft equipment including basic no-install bar-top units, mobile kegerators and complex custom installs. “As we work to build the wine-on-tap category, we’ve learned that while most operators are very interested in pouring wine-on-tap, the cost of a new install makes that challenging. The goal of Free Flow’s Leasing Program is to build a variety of new and innovative custom draft dispense solutions for wine, beer and cocktails that will help grow the category. Our hope is that this program will make it possible for all operators to transition their wine by-the-glass programs to on-tap” said Jordan Kivelstadt, Co-Founder & CEO of Free Flow Wines. With no capital investment required and a lease-to-own option, Free Flow will offer various financing plans with flexible terms and payment options. This program is intended for restaurants, bars and event venues throughout the country who are interested in having the ability to pour wines on tap but have capital constraints. Financing is available for wine draft equipment and any other draft equipment for beer, coffee and spirits. All new financing inquiries will go through Free Flow Wines at leasing@freeflowwines.comor 415-626-1215 x306. Draft equipment options are also available for sale through TAP’D Draft Solutions. Want to keep up with the latest Wine-On-Tap news? Sign up for Free Flow's monthly newsletter, Wine On Tap Today! Please Join us this Sunday, December 3rd, for a Wine Country Benefit! Join us - eat, drink and be merry for a cause. In partnership with Free Flow Wines, Luna Vineyards is hosting a Napa wildfire relief benefit to support those who were affected by the tragic fires of California Wine Country. 100% of ticket proceeds will be donated to the Napa Valley Community Foundation. Come one, come all! Free Flow Wines announced the winners of the 4th annual KEGGY Awards to honor wineries, distributors, equipment providers and restaurant operators for their exceptional and sustainable contributions to the wine on tap category. The award ceremony, intended to be hosted at Luna Vineyards on October 19th, 2017 was cancelled due to the Napa and Sonoma wildfires. In lieu of the celebration, both Free Flow Wines and Luna Vineyards will be collaborating to host a fire relief benefit on Sunday, December 3rd at Luna Vineyards. This last week has been one of the most challenging in wine country’s history. Many of us were awoken early Monday morning to flames, evacuations and a tremendous amount of uncertainty. Free Flow was fortunate – all members of our team are safe, no one lost their home and our facility was unscathed. We are so grateful. This feeling of gratitude is coupled with the tremendous sorrow we feel for the community, our family, friends and colleagues that were less fortunate. In response to this catastrophe, our community has come together to support the thousands of people displaced by the fires and more than 10,000 first responders that risked everything to save our lives, homes and businesses. We cannot thank the first responders enough for their tireless efforts. Free Flow’s annual KEGGY Awards - a celebration that brings wineries, distributors and retailers nationwide together in wine country to commemorate what makes our industry so special - was scheduled for October 19th. While our community has demonstrated incredible cohesion throughout the past week, I believe that now is the time to focus on rebuilding and supporting those whose lives were so profoundly impacted. Therefore, we have decided to cancel the event. Free Flow will in turn, redirect those efforts in partnership with Luna Vineyards, to host a fire relief benefit on Sunday, December 3rd. We can now shift the energy, resources and funds we were putting towards celebrating our community, into rebuilding it. I encourage everyone to find some way to support the people who have been displaced by the terrible fires. If you’re looking for a place to donate, we recommend the Napa Valley Community Foundation and the Sonoma Community Foundation. The entire Free Flow team is sending our thoughts to all of those impacted. We truly appreciate the incredible outpour of concern and support from our partners, friends and colleagues across the country and intend to pay forward that kindness, by helping our community rebuild. Thank you and stay #WineCountryStrong! Level up your keg game with Free Flow Wines' quarterly State of the Market webinar, presented by Free Flow Wines CEO & Co-Founder, Jordan Kivelstadt. This quartely webinar, a part of Free Flow's Institute, dives into in-depth market analysis, national & regional account updates, current wine-on-tap trends and concludes with a live Q&A. The webinar is scheduled for Monday, October 30th at 11:00AM PT and interested parties can sign up for the event here. Please note: This webinar is available exclusively for our winery clients. As of July 1st, 2017 TAP’D Draft Solutions has merged with HHBMS, Inc., Draft Maintenance Company. The companies will do business as TAP’D Draft Solutions, a draft installation and maintenance division of Free Flow Wines. TAP’D Draft Solution’s expanded service area will now include Alameda, Contra Costa, Lake, Marin, Mendocino, Napa, San Francisco, San Mateo, Solano, Sonoma and Yolo counties with the addition of more field technicians. Harry Harris, the former President of HHBMS, Inc. will be taking over as General Manager of TAP’D Draft Solutions. With over thirty years of experience in Bay Area draft maintenance solutions, Harris brings a wealth of knowledge and connections. “I am looking forward to helping TAP’D Draft Solutions expand its services in the greater Bay Area and beyond,” said Harry. Additionally, Adam Beese has been named the North Bay Supervisor and will oversee operations and expansion throughout the region. TAP’D Draft Solutions now has 33 employees and operates out of the Free Flow Wines headquarters in Napa, California. The company provides high-quality draft installation and line cleaning services for key accounts throughout Northern California including Levi's Stadium, Marriott Hotels, Hilton Hotels, Hillstone Restaurant Group, and more. TAP’D Draft Solutions provides custom draft design, installation, maintenance and line cleaning for draft systems. The company’s draft solutions enable innovative new products that go beyond beer and wine, to include on-tap cocktails, spirits, coffee, and more. Formerly Cuff’s Tap Service, the company has been the leading provider of beer and wine draft services in the Bay Area since 1999. Their team has decades of experience installing, maintaining and troubleshooting all types of draft systems. TAP’D Draft Solutions is a division of Free Flow Wines and can be found online at TapdDraft.com and on Facebook & Instagram @tapddraft. Call 1-844-ALL-TAPS for more information. Why Does Paul Leary of Blackbird Vineyards Keg with Free Flow Wines? Dedicated to terroir-driven, handcrafted and expressive wines, Blackbird Vineyards does not sacrifice an ounce of quality. In effort to stay on trend and explore sustainable packaging beyond the glass, Blackbird Vineyards decided to put their premium wine in the hands of Free Flow Wines. Blackbird Vineyards is currently kegging Rosé, Malbec and Arise Napa Valley Bordeaux Blend, which is one of the most premium red wines available on tap in the United States. Click here to see full version with photos. 2017 KEGGY Awards - Last Chance to Nominate! The 4th annual KEGGY Awards will be held this October in Napa, CA. Once again, we will roll out the green carpet to award our industry partners for their outstanding sustainability achievements and stellar wine-on-tap programs. This year's ceremony will include the highly-coveted People's Choice Award which honors one exceptional account pouring wine-on-tap. We are accepting nominations through June 30th for your favorite restaurant, bar, hotel, or any other location showcasing an incredible kegged wine program. Voting commences July 1st. REDUCE: There is a 96% reduction in the CO2 footprint with reusable stainless steel kegs. No corks to pull, no foil to cut, no bottles to recycle, and no heavy cases to ship. REUSE: Our stainless steel kegs are 100% reusable. Free Flow Wines has also invested in a state-of-the-art water reclamation system that recycles 99% of all water used by the company. RECYCLE: Aluminum cans are recycled more than any other material. Aluminum also contains more than three times the recycled content of glass or plastic (PET) bottles. Do yourself -and the planet- a favor and drink sustainably! The walls are up, the tanks are in, equipment is fine-tuned and we had our first customer keg in February! This new facility offers keg leasing, filling, fulfillment, bulk storage and logistics services, and is conveniently located near the Port of Newark in Bayonne, NJ - an ideal location for kegging imported and east coast wines. Filling Station East will also greatly improve our return logistics - allowing us to route empty kegs on the east coast directly to NJ, reducing our carbon footprint and lowering your costs along the way. Interested in our bulk storage program or filling on the east coast? Email info@freeflowwines.com to get started! Free Flow Wines, the pioneers of premium wine on tap, announced today an expansion of services to include a wine canning program at their Napa headquarters. The program will launch in April 2017 and provide services for filling 375ml and 250ml cans with wine, sake, cider and sparkling wine products, allowing wineries around the world to send bulk wine to be kegged and canned at the same location. Free Flow is actively in discussion with numerous wineries to bring their products to market in can format later this spring. Wine-kegging companies Gotham Project and Free Flow Wines have teamed to open a new East Coast facility that they say will dramatically increase their output of premium imported wines-on-tap. This week, Gotham and Free Flow—which together control nearly 70% of the burgeoning wine-on-tap market—are opening the 12,000-square-foot Filling Station East in Bayonne, New Jersey. The new facility will give Free Flow and Gotham Project a coast-to-coast national platform with a dedicated eet of 150,000 stainless steel kegs. The facility is strategically located to service the key imported wine markets along the East Coast. With Free Flow and Gotham Project spearheading the category over the past seven years, draft wine has been steadily expanding its presence in the on-premise market, driven by domestic oerings. Free Flow, which distributes more than 250 wine brands in kegs nationwide, also operates a 25,000-square-foot headquarters in Napa. Gotham Project, based in New Jersey, has been distributing to about 30 states. Overall, the wine-on-tap market in the U.S. is expected to top 300,000 kegs (or about 650,000 nine-liter cases) in 2017 after exponential growth over the past few years. Join the Free Flow Wines Team! We are looking for candidates who are passionate about what they do, enjoy working hard and thinking outside the ‘bottle’, but also appreciate a work-life balance. At Free Flow, a diverse, supportive and fun environment is core to our culture and we are looking for employees who share these same values. If you enjoy a fast-paced and dynamic workplace and care about quality, customer success and sustainability, we are looking for you. We believe that by attracting and retaining the best talent, together we can build a category that will make a difference, from the wines that are poured into your glass to saving the world – one keg at a time. See what openings are available here. the expansion of varietals available in keg and an incredible showing at Free Flow Wines' KEGGY Awards this year. Stay up to date with the latest wine on tap trends by signing up for Free Flow Wines monthly newsletter today! Join Free Flow for the November Wine-On-Tap Sales Training! Join us for our monthly "Wine-On-Tap Sales Training' webinar on Thursday, November 17th at 10:30AM PT with Chairman & Co-Founder, Dan Donahoe. Dan will cover the basics on how to effectively sell wine on tap, review draft equipment basics, potential market opportunities and a live Q&A. View the winners of the 2016 KEGGY Awards here. Want to be 'in the know' with all things wine on tap? Keep up to date with all the latest Free Flow News by joining our mailing list. Our Wine On Tap Today newsletter is sent out the second Friday of every month and includes Free Flow updates, wine on tap trends, talking points for by the glass programs and more! This month's Free Flow Stories Series features Round Pond Estate, a Napa Valley winery that has opened a whole new channel ofdistribution by offering their wines on tap. Join Free Flow For Their First Ever Wine-On-Tap Sales Training! You asked for more sales training and we listened! Join us for our first ever 'Wine-On-Tap Sales Training' webinar Friday, September 9th with Chairman & Co-Founder, Dan Donahoe. Dan will cover the basics on how to effectively sell wine on tap, review draft equipment basics, potential market opportunities and a live Q&A. Attending the Wines & Vines Packaging Conference on Wednesday, August 17th? Come #showyoursteel with us at booth #30! Catch up with Heather and Georgia on the latest Wine On Tap trends, how our Performance Pricing Program is reducing costs, and all the exciting things about to happen at the Free Flow facility! If you would like to set up time to talk about our custom kegging & leasing programs, please email Georgia at georgia@freeflowwines.com. KEGGY People's Choice Voting Is Now Open! Nominate your favorite neighborhood spot (with taps! ), the bar with the most beautiful wine draft system you've ever seen, a venue where you enjoy wine on tap, or a restaurant whose commitment to sustainability extend from the dishes they create to the wines the pour on tap at: http://freeflowwines.com/keggy-awards-peoples-choice-award-nominee-form/. Or, share a photo with the hashtag #KEGGYAwards to Facebook, Twitter, or Instagram! Don't forget to follow us (@FreeFlowWines) for more voting details! Voting will commence July 1st. Our "Stories Series" campaign launched last year, featuring a selection of our partners and the success they've found with wine on tap. We know that to see continued growth in the category, we need to see success at all levels - from the production floor to first pour. 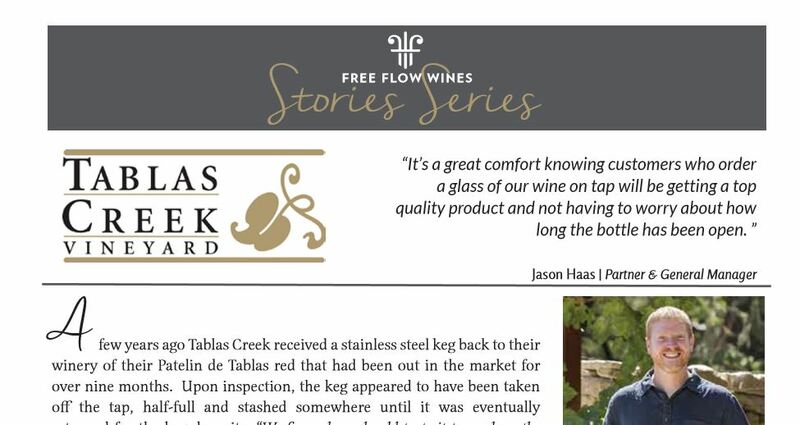 This month's Stories Series features Tablas Creek, a vineyard in Paso Robles, talking about the challenges of managing their own keg program before working with Free Flow and the success they've found with kegging their wine. Now Accepting 2016 People's Choice KEGGY Nominations! Know a restaurant account with an outstanding wine on tap program? Then we want to know! Nominate your favorite neighborhood spot (with taps! ), the bar with the most beautiful wine draft system you've ever seen, a venue where you enjoy wine on tap, or a restaurant whose commitment to sustainability extend from the dishes they create to the wines the pour on tap here: http://freeflowwines.com/keggy-awards-peoples-choice-award-nominee-form/. Or, share a photo with the hashtag #KEGGYAwards to Facebook, Twitter, or Instagram! Don't forget to follow us (@FreeFlowWines) for more voting details! Voting will commence July 1st. New Website Outlines Success with Wine On Tap! FreeFlowWines.com has been completely re-designed and includes a host of useful resources including information on our draft equipment partners, new sales & marketing tools and much, much more! We'd love to hear what you think of the revamped site, so email us today at info@freeflowwines.com. Imagine ordering a glass of wine at a bar and having it served at the perfect temperature and tasting consistently the same, time after time. "That's what [wine on tap] is all about: delivering a better glass of wine," said Jordan Kivelstadt, CEO and cofounder of Napa-based Free Flow Wines, a kegging service provider. Napa, CA, August 18, 2015—Inc. magazine today ranked Free Flow Wines as no. 1081 on its 34th annual Inc. 5000, an exclusive ranking of the nation’s fastest-growing private companies. The list represents the most comprehensive look at the most important segment of the economy—America’s independent entrepreneurs. Companies such as Yelp, Pandora, Timberland, Dell, Domino’s Pizza, LinkedIn, Zillow, and many other well-known names are members of the Inc. 5000. Free Flow Wines is the pioneer of premium wine on tap, one of the fastest growing segments of the wine and hospitality industry. The company has emerged as the largest kegging service provider, supporting the wine industry with logistics and marketing to support the wine on tap category. More than 3,900 locations nationwide now offer wine and other products on tap and that number is rapidly increasing. Free Flow Wines was the only Napa-based company to make the 2015 Inc. 5000 list. The company currently fills over 12,000+ kegs per month for more than 220 quality wine brands. They recently expanded their wine on tap program to include other innovative draft products like spirits, coffee and sake, and the company plans to introduce additional on-tap products in the future. The 2015 Inc. 5000, unveiled online at Inc.com, is the most competitive crop in the list’s history. The Inc. 5000’s aggregate revenue is $205 billion, generating 647,000 jobs over the past three years. Complete results of the Inc. 5000 can be found at www.inc.com/inc5000. Free Flow Wines’ Inc. 5000 listing can be found at http://www.inc.com/profile/free-flow-wines. Free Flow Wines will be attending the annual Inc. 5000 event that honors all of the 2015 companies, October 21 through 23, 2015 in Orlando, FL. The 2015 Inc. 5000 is ranked according to percentage revenue growth when comparing 2011 to 2014. To qualify, companies must have been founded and generating revenue by March 31, 2011. They had to be U.S.-based, privately held, for profit, and independent – not subsidiaries or divisions of other companies – as of December 31, 2014. (Since then, a number of companies on the list have gone public or been acquired.) The minimum revenue required for 2011 is $100,000; the minimum for 2014 is $2 million. Feedback from winery partners is the core of business at Free Flow Wines, especially when it comes to improving services for clients. In order to see continued growth in the wine on tap category, success is needed at all levels - from production floor to first pour. Free Flow is excited to announce the launch of a new "Stories Series" campaign featuring partners and their success stories with wine on tap. Stories of success will be shared from various viewpoints within the category - from winery to distributor to account pouring wine on tap. Kathryn Hall of HALL Wineswas an early adopter of the wine on tap movement and has happily seen the category continue to grow, with her HALL Sauvignon Blanc thriving on tap. Her story is below. WITH THE DROUGHT ENTERING its fourth year, water is a topic on every California grower’s mind, but it also affects wineries. It takes a significant amount of water to process grapes into packaged wine, and disposing of that water has become a big issue as well. Free Flow Wines in Napa, which offers kegging and logistics services that allow wineries to deliver wine on tap, is not a winery, but it has the same problems that wineries face with regards to wastewater resulting from its wine delivery, keg and equipment cleaning and other process water. Free Flow kegs wine for many wineries. The wineries drop off small lots of finished wine in totes (275 gallons), tanks or tanker trucks. Free Flow fills kegs with the wine, ships them to distributors and retailers, then retrieves the kegs for reuse, which means the company has to clean and then refill them. The company said that its cleaning processes have been vetted by the world’s most sophisticated quality control teams and their standard operating procedures were developed entirely in-house. Its 14-stage cleaning and sparging process ensures that every keg is cleaned and made wine-ready. These cleaning, filling and tracking systems ensure that fine wine gets from the barrel to the tap tasting just the way the winemaker intended, according to the company. Needless to say, achieving this involves a lot of water. After being quoted a cost of $1.9 million to hook up and then pay by the volume to discharge wastewater into Napa Sanitation’s system, or $50,000 per year to haul off the wastewater, Free Flow opted to spend $400,000 for a bioreactor and ultra filtration system instead. The water that emerges is clean enough to drink, and certainly suitable for cleaning kegs and other equipment. To date, Free Flow has reused more than 1 million gallons of water and kept $1.5 million in the bank. The company uses and reuses about 3,000 gallons of water per day. In addition, Free Flow said that its customers have saved more than 4,285,564 wine bottles from U.S. landfills. 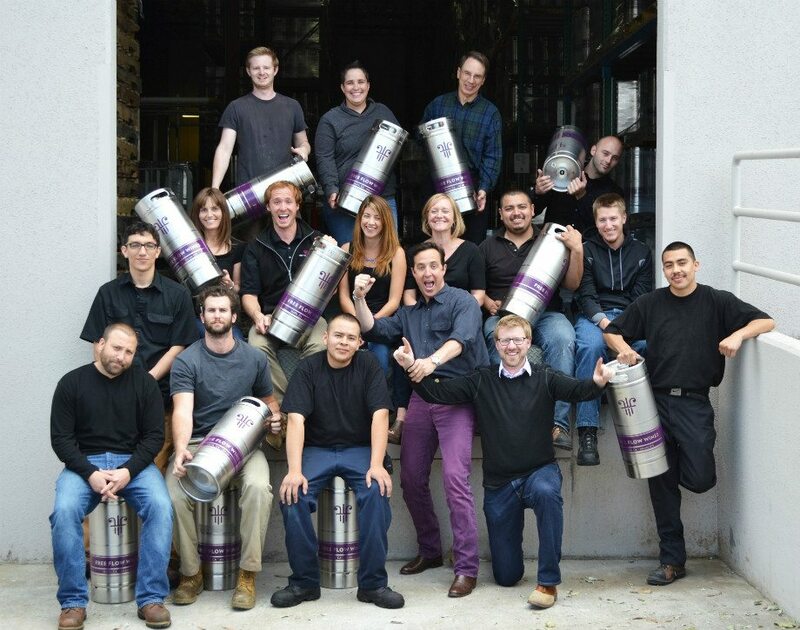 There is a 96 percent reduction in the CO2 footprint with reusable stainless steel kegs. With more than 3,900 locations in the United States that offer wine on tap, there is a tremendous amount of packaging and solid waste that has been eliminated from landfills by restaurants, hotels, sports and entertainment venues nationwide. The two leaders in the wine on tap category, Free Flow Wines and Gotham Project, have announced a joint venture for a state-of-the-art production facility on the East Coast. The new kegging facility is expected to open in late 2015 in Kearny, New Jersey, subject to regulatory approval. The facility will be adjacent to the largest port in the country for imported wines and will offer kegging and logistics support to wineries, importers and distributors on the East Coast. Both companies will continue separate operations, with the joint facility enabling Free Flow Wines to better service clients on the East Coast and in Europe and allowing the Gotham Project to scale its business. Gotham Project will continue to keg and sell their portfolio of wines as they always have, while Free Flow will continue to focus on kegging services, logistics and category building. Free Flow Wines will also continue to maintain their headquarters and West Coast production facility in Napa, CA. Napa, CA, April 20, 2015—Ordering a glass of wine on tap is the green thing to do this Earth Day. Free Flow Wines, the pioneer of wine on tap, today unveiled new waste reduction numbers highlighting the green aspects of wine on tap in stainless steel kegs. In conjunction, Free Flow Wines unveiled their latest sustainability numbers and a new infographic, titled ‘Greener, Fresher, Better,’ that showcases the green benefits and lower carbon emissions that wine on tap in a stainless steel keg offers. The company also announced today that they are now Green Certified by both the Bay Area Green Business Program and the California Green Business Program. Free Flow Wines complies with the environmental regulations that distinguishes small businesses that protect, preserve and sustain the environment. In addition to their environmentally friendly stainless steel kegs, Free Flow Wines has a state-of-the-art water reclamation system that recycles 99% of all water used by the company. Free Flow Wines’ kegging and logistics services have brought more than 220 premium wine brands to the taps of more than 3,900 restaurants, hotels, sports, and entertainment venues nationwide. To date, the company has removed more than 4,285,564 wine bottles from U.S. landfills, equaling more than 6.5 million pounds of trash. Each Free Flow Wines keg holds the equivalent of 26 wine bottles and each keg that goes into distribution will save 2,340 lbs. of trash from the landfill over its lifetime. The company currently has over 80,000 stainless steel kegs in their fleet. The Free Flow Wines kegging equipment was custom built for placing fine wine safely into kegs and their state-of-the-art facility has been vetted by the wine industry’s most sophisticated quality control teams. Premium wine in the Free Flow kegs never sees oxygen so it’s guaranteed fresh and there is no wasted wine. Free Flow Wines currently fills more than 9,200 kegs per month for wineries and distributes the kegs to thousands of venues around the country. Free Flow Wines is the pioneer of premium wine on tap and delivers the world’s wine brands to the taps of restaurants and venues nationwide. Free Flow Wines’ kegging and logistics services have allowed the wine and hospitality industries to move away from bottles to a sustainable, environmentally friendly way of serving wine on tap, while maintaining wine integrity from the barrel to the tap. Free Flow Wines was founded in 2009 and has more than 220 wine brands in kegs, such as Frog’s Leap from the Napa Valley, King Estate Winery from Oregon and Diseno from Mendoza, Argentina. Their clients’ wines are offered to a variety of restaurants, premium hotels, sports and entertainment venues nationwide. The company is located in Napa, California, and you can find them online at FreeFlowWines.com, on Twitter, Facebook, Instagram and Flickr @FreeFlowWine. Napa, CA, November 13, 2014—Free Flow Wines, the pioneer of premium wine on tap, today announced that several boutique Napa Valley wines are now available in a keg format and are currently featured on tap at the Napa Valley Film Festival. Free Flow Wines provides wine kegging and logistics services for a number of Napa Valley wineries and those featured at the festival include Somerston’s Priest Ranch, Peju’s Tess, DEFINE Wines, and Flora Springs. Napa Valley Film Festival attendees will get a chance to taste these acclaimed wines on tap at select film festival special events, giving attendees access to the latest trend in wine packaging. Free Flow Wines' kegging and logistics services have allowed more than 200 premium wines to be available on tap at over 3,000 restaurants, hotels, airports, sports, and entertainment venues nationwide. The Free Flow Wines kegging equipment was custom built for placing fine wine safely into kegs and their state-of-the-art facility has been vetted by the wine industry’s most sophisticated quality control teams. Premium wine in Free Flow kegs never sees oxygen so it’s guaranteed fresh and there is never wasted wine or spoilage. Wine on tap is currently being served at special Napa Valley Film Festival events, taking place November 12 – 16, 2014. The event will feature high-end Napa Valley wines at various locations throughout the valley. The Free Flow kegs will allow these wines to maintain quality while cutting gown on the amount of waste that is generated at the event. Over the 20-year life of a Free Flow stainless steel keg, the carbon footprint of the same amount of wine poured from bottles is reduced by 96%. Free Flow Wines has removed almost 3.9 million bottles of material waste from U.S. landfills since their inception in 2009. The company is proud of the quality of their kegs and their commitment to the environment. The Napa Valley Film Festival (NVFF) is a registered 501c3 non-profit organization headquartered in Napa, California. The mission of the Napa Valley Film Festival is to celebrate the cinematic arts and enrich the community by presenting an annual world-class festival and year-round education and outreach programs. The ultimate celebration of film, food and wine, NVFF lights up the picturesque towns of Napa, Yountville, St. Helena and Calistoga at the most colorful time of the year. NVFF features over 100 new independent films and studio sneak previews screening in 12 beautiful venues throughout the four walk-able villages, as 300 visiting filmmakers interact with audiences at screenings and intimate events. Attendees enjoy film panels & culinary demonstrations, wine tasting pavilions, the spectacular Festival Gala, Celebrity Tributes, Awards Ceremony, an array of parties, VIP receptions, winemaker dinners and more. NVFF takes place November 12 – 16, 2014. Passes on sale now here: napavalleyfilmfest.org. Free Flow Wines is the pioneer of premium wine on tap and delivers the world’s wine brands to the taps of restaurants and venues nationwide. Free Flow Wines' kegging and logistics services have allowed the wine and hospitality industries to move away from bottles to a more sustainable, environmentally friendly way of serving wine on tap, while maintaining wine quality. Free Flow Wines was founded in 2009 and has more than 200 wine brands in keg from Frog’s Leap in the Napa Valley, to 10 Span Vineyards in Santa Barbara and Banfi’s Aviatto from Alto Adige. Their clients' wines are offered on tap at a variety of restaurants, premium hotels, sports and entertainment venues nationwide. The company is located in Napa, California, and you can find them online at FreeFlowWines.com, on Twitter, Facebook, Instagram and Flickr @FreeFlowWine. Free Flow Wines in Forbes Magazine! "Are kegs the future for wine"? We have been featured in an article in Forbes magazine talking about the future of wine on tap. To read more, click on the link below. If you're at Unified this week, be sure to stop by the Free Flow Wine's booth! We're located on the third floor, booth #3. Meet the team and learn all about the world of wine on tap and what Free Flow has to offer! Free Flow Wines at Innovation Napa Valley! Free Flow Wines on WineOhTV! 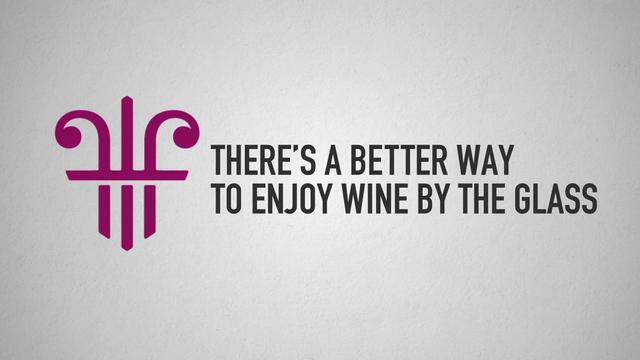 Did you catch Free Flow Wines on WineOhTV? Check out a great episode about wine on tap filmed at Jamber in San Francisco, including a pouring of Qupe grenache! Napa, CA, August 20, 2013 — Free Flow Wines, the pioneer of premium wine on tap, announced today that more than 250 premium wines are now on tap at more than 1,500 restaurants, hotels, sports and entertainment venues nationwide thanks to Free Flow Wines’ kegging and logistics services. Free Flow Wines has spent the past three years building the infrastructure to make wine on tap a reality for the wine and hospitality industries. Small and large venues, like Marriott Hotels and Caesars Entertainment, are now offering wine on tap at their bars and restaurants. Free Flow Wines recently spearheaded a change to two Florida laws that limited the size of wine containers to one gallon. The new laws allow restaurants and hospitality chains to offer wine on tap in their restaurants across all 50 states. The Free Flow Wines kegging equipment was custom built for placing fine wine safely into kegs and their state-of-the-art facility has been vetted by the wine industry’s most sophisticated quality control teams. The company will increase their fleet of 30,000 reusable kegs to 50,000 by the end of this year and is moving to a new 22,000 square foot facility in Napa. Free Flow’s logistics services enable effective distribution of wine in this new format and wineries, from large corporations to small family-owned vineyards, are now offering their premium wines via Free Flow Wines. Free Flow Wines is a more sustainable, environmentally friendly way to serve wine on tap for the wine and hospitality industries. These industries are moving away from bottles to tap systems to maintain wine integrity from the barrel to the glass, while cutting down on waste. Each wine keg holds the equivalent of 26 bottles and in 2012 Free Flow Wines saved 347,254 bottles, corks, capsules, labels and cases (equaling over 260 tons of packaging waste) from landfills nationwide. For a list of the premium wines available through Free Flow Wines: http://bit.ly/11rDqxA. focused on perfecting their kegging and logistics services, the company recently sold the Silvertap brand to The Smart Wine Company and is now 100% focused on kegging and logistics services for premium wines. maintaining wine integrity from the barrel to the tap. Free Flow Wines was founded in 2009 and has more than 250 large and small winery clients from Trefethen Family Vineyards in Napa Valley, to SIMI Winery in Sonoma and King Estate in Oregon. Their clients’ wines are offered on tap to a variety of restaurants, premium hotels, sports and entertainment venues nationwide. Find them online at FreeFlowWines.com, on Twitter, Facebook, Instagram and Flickr @FreeFlowWine. Check out this awesome actricle about Free Flow Wines featured in the North Bay Business Journal! Wine on Tap - #1 Hot Trend in 2013 NRA Survey! "Wine on Tap" was just listed as the #1 Hottest Trend in 2013 in the National Restaurant Association's Bartender Trends Survey in the wine category. Please take a moment to review our performance pricing than reach out to Georgia@freeflowwines.com to learn how to get started!